Among the spices, black pepper is the king. It is the most important, most popular and most widely used spice in the world. It has extensive culinary uses for flavouring and preserving processed foods and is important medicinally. Of the total spices traded internationally pepper accounts for about 34% (throughout this chapter, pepper is used to mean black pepper, unless otherwise stated). South West India is the traditional home of this important spice, particularly the Western coastal regions of South Peninsular India (the Malabar Coast). Black pepper was the first oriental spice to be introduced into the Western world, and was well known among the Romans and Greeks. In the middle ages pepper assumed great importance in Europe. Its use resulted in revolutionary changes in Western cooking: together with other spices, pepper helped to improve flavour and preservation of food became easier. Pepper was also used in medicine, as a carminative and febrifuge, for aiding in digestion, and in curing the common cold. How it looks—It is a stout climbing perennial with roots at the nodes. The leaves are heart shaped and the flowers spiky and very small. The fruits are globose and one-seeded and appear bright red when ripe with rounded seeds. What it does—It is anthelmintic, carminative, aphrodisiac, emmenagogue, stimulant, digestive, diuretic and alterant. In cough—Powdered pepper with honey, ghee and saunph is licked to relieve from all kinds of cough. In hysteria—Black pepper with bach is taken to soothe nerves in cases of hysteria. In diarrhoea—1 tsp of fine powder of pepper should be taken with water to arrest diarrhoeas of even very chronic nature. Lack of appetite and cough—Black pepper powder is gently roasted in a pan, powdered and mixed in molten jaggery. This preparation is rolled into tiny pills and allowed to become firm on cooling and stored. Pill should be taken twice a day to stimulate appetite. In indigestion—Pepper powder mixed in butter milk, is a good digestive. In colds—To relieve from colds, pepper made into a “rasam” with tamarind is a popular remedy. To a tsp of hot ghee, 1/2 tsp of black pepper powder is added, to which dilute tamarind water is added and boiled for a few minutes. Some coriander leaves may be added in the end for additional effect. The patient experiences the effect of fomentation while taking this “Rasam” and thereby nasal blockage is relieved. In pus in gums—Finely powdered pepper and salt is massaged over the gums to relieve inflammation. In painful joints—Pepper, cumin and ginger boiled in mustard oil is an effective massage oil to apply on painful joints. In stammering—Mix almond without seed coat and black pepper in equal amount Make a paste, add honey, take it in the morning for a month. 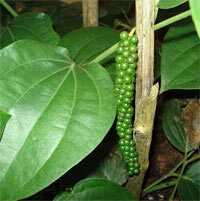 1. Pepper has been shown to enhance bioavailability in experimental studies. 2. Pepper was part of an ayurvedic formulation found effective against dental diseases in a study conducted at Udaipur. In India pepper is cultivated in an area of around 181.500 ha with an annual production that fluctuates between 60-80.000 tonnes annually (75.000t in 1999 and 60,000t in 2000). Kerala state is the major producer accounting for 72% of the crop, followed by Kamataka (22%) and the remainder is from Tamil Nadu, Andhra Pradesh and Goa. India started export of value added products of pepper in the 1970s. Until 1970 only small quantities of spice oil and oleoresin were manufactured and exported from India. Until that time pepper was exported only in the raw form and in bulk. Though there has been demand for diversified products of pepper, even now Indian export of black pepper is mainly in bulk and raw form. Piperine was first isolated by Oersted (1819) as a yellow crystalline substance. This alkaloid is the major pungent component present in pepper. In addition, five minor alkaloids possessing pungency have been identified in pepper extracts. As already mentioned the aroma and flavour of black pepper is due to the essential oil content and this oil can be recovered by hydrodistillation or steam distillation. The essential oil contains monoterpenes, sesquiterpenes and their oxygenated derivatives having boiling points in the range of 80-200°C. Industrial production of pepper essential oil is by steam distillation, by passing steam through pepper powder contained in a distillation chamber. The volatile oil that comes out along with the steam is collected in the condenser and later recovered, dried and stored in airtight containers. Oleoresin is commonly marketed as spice drops and contains the total pungency and flavour constituents of pepper. Oleoresin is produced by solvent extraction of pepper powder using a suitable organic solvent such as acetone, ethanol, ethyl acetate or ethylene dichloride. Either a one-stage or a two-stage process is employed for this. In the first case the oil is recovered along with the resins by solvent extraction. In the second process the oil is recovered by steam distillation followed by solvent extraction for recovering the oleoresin. Later the oleoresin and oil arc blended to meet the required specifications. The organic solvent should be recovered completely from the oleoresin and the ISO as well as the importing countries have fixed maximum permissible limits for the approved solvents. The whole extraction process of oleoresin is usually done in batch extractors. Piperine, the active ingredient in pepper, exerts substantial analgesic and antipyretic effects. Lee et al. (1984) found that piperine reduces inflammation in corragenin induced tests at an oral dose 50mg/kg body weight. The anti-inflammatory effect was substantiated by Kapoor et al. (1993). Piperine and its homologues get absorbed through skin, and hence are capable of acting on the subcutaneous tissues as well as on nerves and blood vessels. The effect of pepper on the nervous system and on sexual organs (priapism) indicates anticonvulsive and vasodilatoral properties. Pepper also has an effect on lactation by increasing milk production. Pepper oil warms the skin and brings blood to the surface, stimulating circulation. In Ayurveda, pepper is used in the treatment of epileptic fits and to bring about sleep. Piperine exhibited protection against penetrazole induced seizure and also against electroshock seizure (Won et al. 1979). Piperine also possesses strong potentiating effect on hexobarbital induced hypnosis in mice. A compound of great interest extracted from pepper is 1-(3-benzodioxol-5yl)-1-oxo-2-propenyl-piperidide, known as antiepilepsirine, which was shown to have strong antiepileptic properties. This is used in Chinese hospitals for the treatment of epilepsy (Ebenhoech and Spadoro 1992). Both pepper and piperine exert liver protective action. Kaul and Kapil (1993) found that piperine reduces in vitro and in vivo lipid peroxidation and prevents depletion of GSH (Gastricsulfhydryls) and total thiols. This is a very significant property, as lipid peroxidation causes free radical production that causes tissue damage. Pepper has antioxidant activity which is attributed to the tocopherol and polyphenol contents in pepper. Supercritical carbon dioxide extracts of ground black pepper have been found superior in reducing lipid oxidation of cooked ground pork (Tipsrisukond et al. 1998). The antioxidative activity of black pepper can, at least partially, be ascribed to the presence of glycosides of the flavonoids kaempherol, rhamnetin and querectin (Viisgen and Herrmann 1980), as well as to the phenolic amides. Nakatani et al. (1986) established that all the five phenolic amides present in pepper possess very good antioxidant property, which is even superior to that of the synthetic antioxidants like butylated hydroxy toluene and butylated hydroxy anisole. Addition of pepper to foods increases their keeping quality and prevents their spoilage, due to the antimicrobial properties of pepper. The essential oil of pepper is found to be inhibitory to Vibrio cholerae, Staphylococcus albus, Clostridium diphthereae. Shigella dysenteriae. Streptomyces faecalis. Bacillus spp., Pseudomanas spp., etc. Pepper oil stopped the growth and aflatoxin production by Aspergillus parasiticus at a concentration of 0.2-1%. Pepper leaf oil also exhibits antifungal activity. Pepper is often used three times in the same dish before the food is eaten; first in the kitchen, as an ingredient in the dish; secondly, to correct or improve the overall seasoning during cooking; and thirdly at the dining table for the diners to add more spice and flavour to the prepared dishes. Both white and black pepper are used. They are used whole, cracked, coarsely ground, medium ground or finely ground. Whole pepper corns arc added as such to meat dishes, fish preparations, soups and pickles. 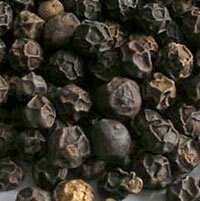 Ground pepper is used in eggs, salads and gravies. Though some foods such as fried potatoes, lady’s finger (Okra), brinjal (egg plant), etc. use only two to three spices, most dishes arc prepared with elaborate combinations of meticulously prepared and freshly ground spices referred to as masala. The masalas vary widely and each masala has a special purpose. Garam masala for example, is a blend of dried and powdered spices, to be used as such or in combination with other seasonings. Pepper has an important role in ‘garam masala’ along with cardamom, cloves and cinnamon. Premavalli et al. (2000) analysed various commercial brands of garam masala and ‘puliyodara’ mixes and found black pepper to be an important ingredient in all of them. Pepper also is a must in freshly cut vegetable salads, such as cucumber, carrot, lettuce, radish, beetroot, onions, tomatoes, etc.. in different combinations. Also, in the universally popular salad dressings, such as French dressing, pepper is a must. Further, as shown in the soup section of recipes (see Appendix), pepper is the only aromatic and piquant agent.